Almost before Trevor Nunn’s “Fiddler on the Roof” opened last December at the Menier Chocolate Factory, it had ‘West End Transfer’ stamped all over it. Tickets were almost impossible to come by during its four-month run, but those disappointed will do well to move fast to catch its inevitable, yet richly deserved relocation to the Playhouse Theatre. The shift to the larger space has lost none of the intimacy and passion: there is always the fear of over-projection, but the subtlety and attention to detail of this production is beautifully intact, gently immersing the audience into the small Russian village of Anatevka in 1905. Designer Robert Jones’ set – a ramshackle Jewish shtetl – spills out into the auditorium; the smokey darkness of the crooked wooden buildings backed by a foreboding bank of bare woodland, yet overlain with folk-tale lanterns and Tim Lutkin’s time-shifting lighting that conjures both the chilly light of an uncertain dawn with heart-warming twilight. A true reflection of the town folk’s stoicism in the face of their impending resettlement. 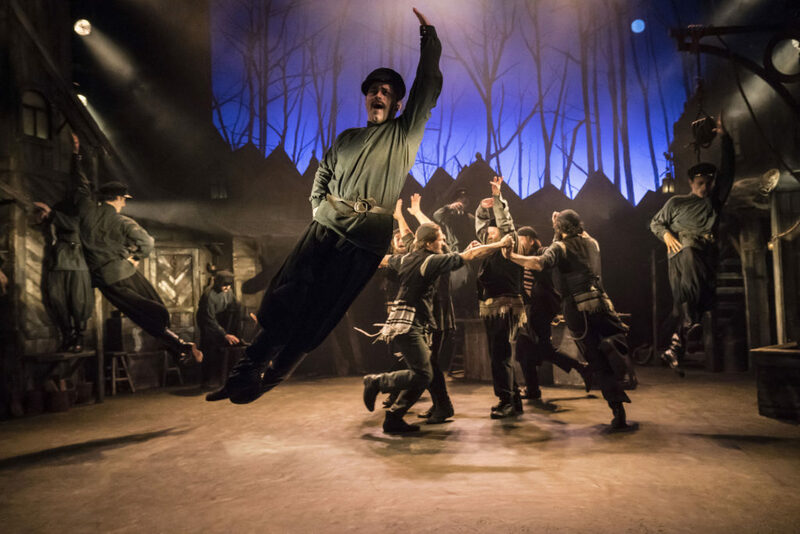 Based on the stories of one of the most famous and beloved of all Jewish writers; Sholem Aleichem, the story centres on Tevye, a poor Jewish dairyman, forever questioning ‘Tradition’, and the mysterious ways in which God moves. A patriarchal figure, his refusal to bend to the changing times is slowly eroded by the strong-willed actions of his daughters, who rebel against the custom of arranged marriage and choose to marry for love. Although he never quite lets go, Tevye’s grip on his heritage is increasingly fragile. Andy Nyman gives a stunningly natural and captivating performance of this central role. Whilst making light of his plight with precision-timed quips and asides, we are also continuously aware of his fear of the threat of exile and, more poignantly, his love for his wife and daughters. Judy Kuhn, as his wife Golde, is the perfect complement that no Matchmaker could cap. Their onstage chemistry evokes the hard-won intimacy built from the ups and downs of a twenty-five-year marriage; culminating in the tender self-realisation of their duet “Do You Love Me?”. In fact, the entire company do wonderful justice to Jerry Bock’s sumptuous score, with a sensitive, but never sentimental, interpretation of Sheldon Harnick’s lyrics. Molly Osbourne, Harriet Bunton and Nicola Brown as the daughters Tzeitel, Hodel and Chava respectively give heartfelt performances, accentuating the satire often missed in “Matchmaker, Matchmaker”. The choral numbers are sung by the company quite beautifully, an inevitable highlight of which is the achingly angelic “Sunrise, Sunset”. But beneath this musical portrait of family and community is the solemn undercurrent of violence, anti-Semitism and persecution; sadly still all too pertinent. Matt Cole’s choreography, paying homage to Jerome Robbins’ original, shows how rapidly high spirits can descend into oppressed chaos, particularly when a vodka-soaked wedding dance is broken by the arrival of a vicious tsarist pogrom at the close of the first act. A threat that is taken to its tragic conclusion in the final scenes. The human touch easily sits alongside the disturbing historical commentary. Yet, despite the epic themes, the staging of this production lends real intimacy to a thousand seat venue, and by avoiding the temptation to overplay to the rafters the emotional impact touches the heart with much more force. Its message is clear; but what is equally clear is that this is quite simply a triumph of a show. Musical theatre at its best. Matchless. Revivals always generate intrigue as to what the creative team has found within a usually decades-old script that will resonate in new ways for modern audiences. When the play is penned by prolific writer David Hare, and helmed by prolific director Sir Richard Eyre, then the intrigue is amped up considerably. You can imagine my disappointment, then, to have the left the theatre none the wiser as to why The Bay at Nice has received a revival at all. 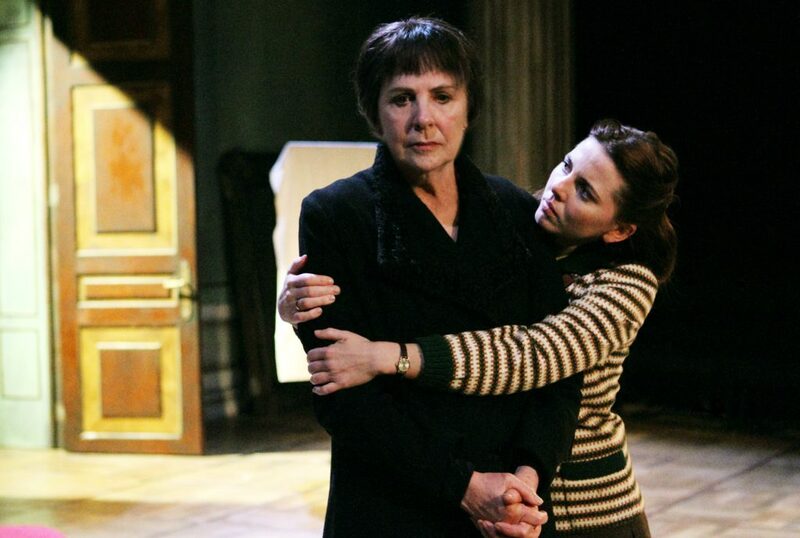 Set in a disused room of an art museum in Leningrad in 1956, hardened and straight-talking Valentina Nrovka (Penelope Wilton) is ostensibly there to authenticate a Matisse painting, but when her docile daughter Sophia (Ophelia Lovibond) informs her that she’s planning to leave her stoic husband for a less successful man (Peter, played by David Rintoul), the ideologies of the pair collide in a clash of the personal and political, freedom and duty, and will and instinct. The play sets these arguments against the subjectivity of the meaning of art, in contrast with the objectivity of the social and political structures in place at the time; for Sophia to get a divorce, for example, she is required to surmount numerous obstacles including advertising it in a newspaper and receiving marriage counselling at huge expense to her, as though not conforming to the state’s idea of love and happiness is something to be deeply ashamed of. The Bay at Nice is packed with enticing themes, but consistently presents them in ways that aren’t engaging. Although Valentina initially chastises Sophia for wanting to leave her husband for Peter, she warms to him so quickly when he’s introduced that any sense of conflict dissipates fairly quickly. The script is also laden with labouring monologues, as opportunities to give the arguments a sense of prescience and agency are ignored in favour of long-winded stories about the characters’ pasts. These shortcomings prevent the design and direction from feeling scarcely more than perfunctory, simply creating a functional space for the actors to do their best with the dirge of anecdotes they have to deliver. But do their best they certainly do. Martin Hutson as the fidgety and eager-to-please assistant curator rounds out a quartet of stellar performances, where each actor brings a unique energy and history to the stage. Wilton, as the epicentre of the play’s action, coaxes nuance out of every word, with such gravitas that there are a number of moments where she simply stands and eyes another character and it is totally enrapturing. The engrossing dynamics of the cast, however, only make you yearn for a script with interactions that fully served them. With such an iconic team involved, it was surprising just how little flair this production contained; The Bay at Nice trudges along with a datedness that fails to justify its return after over thirty years.